Does anyone else feel like November has flown by? A presidential election, unseasonably warm temperatures and Vikings games in the new stadium are just a few of the highlights. We at Metro Transit are thankful for the opportunity to look back and reflect on this month through the stunning photography featuring public transportation in the Twin Cities that we've admired on Instagram. Here we offer a look back at some of our favorite images from this month - which is your favorite? Early mornings are a little darker these days. Car free for the last five years, Michelle Quaranto relies on transit to travel between her home near the Green Line’s Raymond Avenue Station and her job in Eagan. So when the A Line opened on Saturday, she was eager to see how her commute would change once she was able to begin using the region’s first rapid bus service. In the past, Quaranto took Route 84 between the Green Line’s Snelling Avenue Station and the Blue Line’s 46th Street Station. The A Line now offers faster, more frequent service between those two points. Several others who ventured out for their inaugural rides on the A Line were similarly excited about its arrival and the impact it would have on their daily travels. The first of a dozen planned rapid bus lines, the A Line runs between Rosedale Center and the Blue Line’s 46th Street Station on Snelling Avenue, Ford Parkway and 46th Street. Service runs every ten minutes and trips are up to eight minutes faster than regular route buses. 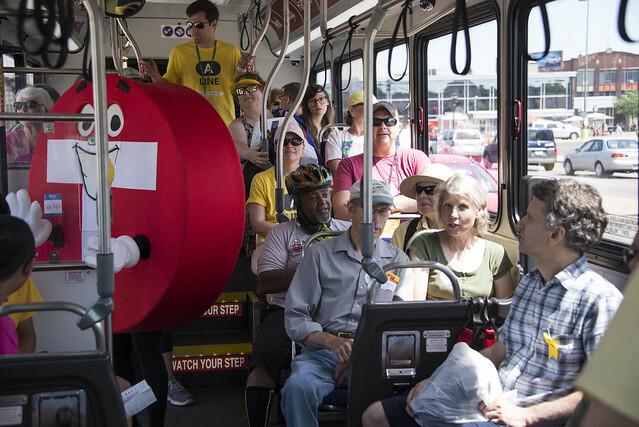 Trips are sped up through a combination of light-rail like features like off-board fare payments, technology that lets A Line buses request longer green lights at intersections and by locating stations a half-mile apart. A Line stations also have heat, light, displays with real-time NexTrip transit information and security features more commonly found on light-rail. “It really is kind of like riding a train,” said North St. Paul resident David Hull as he and his wife Roseanne traveled southbound from Rosedale Center for the first time. Hull’s family of five shares two vehicles, so he was curious to see if he could relieve some of the demand by taking the A Line and the Blue Line to a new job at the Veteran’s Administration. Tyler Schow, a downtown Minneapolis resident who frequently rides transit, noticed a difference even before boarding. “My favorite part is that you can see the bus coming from a distance and instead of stopping it just keeps coming,” Schow said. Bus operators picking up A Line customers for the first time were also enjoying the ride. “What I like about it is it’s very fluid,” Operator Roosevelt Scott said. Others trying out the A Line said it would make them more likely to explore the businesses along the corridor. Rosedale Center, Har Mar Mall, the Minnesota State Fairgrounds, Macalester College, Hamline University, Highland Park and Minnehaha Park are among the destinations served by the A line. The site of a planned major league soccer stadium is also located at University and Snelling avenues. “I like to explore different areas and this is a great way to do that,” said Onrai Terrell who ventured to the A Line’s opening from Eagan by taking the METRO Red Line, a Bus Rapid Transit service on Cedar Avenue, and the Blue Line. Ted Davis, of the Midway Chamber of Commerce, touched on the importance of transit in attracting new businesses, workers and residents as he joined others celebrating the A Line’s opening . “This is how we compete on a global scale, by creating the kinds of places people want to come to,” he said. Metro Transit General Manager Brian Lamb said a network of rapid bus lines would extend the benefits across the region. A planned network of 12 rapid bus lines on busy urban corridors could ultimately account for a third of Metro Transit’s average weekday ridership. “If you can’t figure out how to move people and not just vehicles, we’re not going to achieve what we want to achieve in this region,” Lamb said. The latest sign of progress on what will become the region’s first arterial Bus Rapid Transit Line, the A Line, arrived this week near the corner of Snelling and University avenues. The shelter installed Wednesday on the northbound side of Snelling Avenue is the largest of the BRT shelter types that will be used at 20 station locations along the A Line, which will provide faster, more frequent service between the Rosedale Transit Center and the METRO Blue Line’s 46th Street Station when it opens this year. About 700 people board or get off a bus at this location today. Each BRT shelter will include on-demand heat, emergency phones, schedules and route maps. Off-board ticket vending machines and pylons featuring predicted real-time departure information will also be installed at each stop in the coming months. Heavy station platform construction is nearly complete at all stops and around 20 shelters have now been installed. Shelters will not be available for use by customers until the A Line opens to ensure the safety of customers and to prevent damage to shelters prior to A Line launch. In most cases, the stations will be served both by the A Line and regular route buses. BRT buses also began arriving in December. Like the stations, the vehicles are distinct from regular route service, with unique branding and features that will make service more efficient.